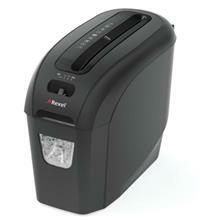 The Rexel Prostyle+ 5 Cross-Cut Shredder will shred up to 6 sheets of 70gsm paper (or 5 sheets of 80gsm) at a time. Ideal for home or home office use, this stylish shredder will shred your documents into small confetti-cut particles measuring 4 x 40mm, giving it a P-4 security rating (and making it suitable for the shredding of highly confidential material). This means an A4 sheet for example gets shredded into approximately 400 pieces! With quiet operation of less than 73 dBA, the Prostyle+ 5 will also shred credit cards, as well as paper clips and staples - so there’s no need to spend time prepping documents prior to shredding. Bin capacity is 7.5 litres, enough to hold up to 50 shredded sheets of paper - and there is an easy lift-off head when you need to empty it. Other features of this shredder include: 230mm (A4) throat width; a reverse option to help clear any paper jams; and a compact size, great if you are looking for a space-saving design and something that fits very easily under a desk or can be stored away easily. Warranty period on the Rexel Prostyle+ 5 Cross-Cut Shredder is 2 years.